This is a Valentine card - check! It has very few layers - check! There is only one design embossed on the front panel - check! The die cutting is not intricate - check! I think this card would meet both criteria. 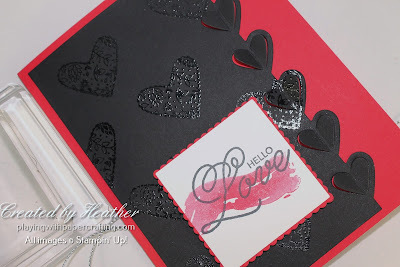 The design embossed with Clear Stampin' Emboss Powder and the design stamped on the sentiment are both from the Sealed with Love stamp set. The paint stroke is from the same kit and the colour was stamped off once before stamping behind the word love. 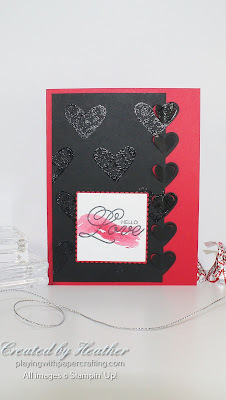 The heart edgelit from Love Notes Framelits makes a great way to easily finish off a page with a unique edge. It gives a 3D effect with those hearts where the edges can stand up. The Layering Squares Framelits trim up the sentiment and provide a background for it. January's Paper Pumpkin has arrived, and is it ever cute!!! I know exactly what I'm going to use it for! And no, I'm not telling what! You'll see eventually. But I thought you'd like to have a look at what it is and how it goes together. Cool, isn't it! Wait until I show you what I did with mine!